The objective of the website as visualized by Client, in the first phase is to provide an online community that uses social bookmarking to aggregate the associations of words. 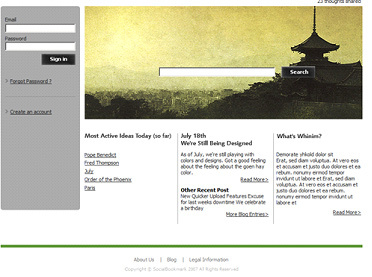 The basic scope includes the abilities: User login, searching, and tagging. STPL has had extensive experience in developing applications for Social Networking websites. STPL also has had experience in developing algorithms and analyzing trends and data being generated on an application like this. Client found STPL’s experience particularly appropriate for the application he had visualized. 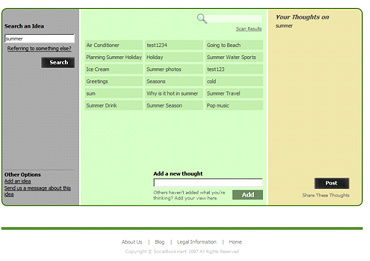 Upon logging in the user will eventually be directed to their unique 'Conversation Board' page. This page will include the dashboard. 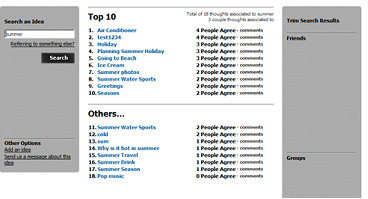 This screenshot separates the results page into three areas. The area on the left is used for searching, the center for results and clarifying, and the right area for segmenting the results. Links to different pages of the site like Search, My Thoughts etc. It has been very challenging building this site. These are the solutions provided for above challenges. simply a randomized selection of links. Algorithm determines which results to display. are determined by links that are not endorsed by other users.